This Ongoing War: A Blog: 22-Dec-11: Know them by their actions. Oh, and by their smiles. 22-Dec-11: Know them by their actions. Oh, and by their smiles. from every faction is holy to us and we must exalt them", he said. For almost as long as there has been organized human society, awards - often in the form of medals - have been given to those whom the society considers to represent its core values. The Palestine Liberation Organization has such an award. It's called the Jerusalem (or Al-Quds) Medal, and the decision to give it to someone is made only after the head of the PLO signs off. The head of the PLO, for years the appalling Yasser Arafat, is today Mahmoud Abbas, who in his day job is head of one of the two Palestinian Arab governments, the one called the Palestinian Authority. 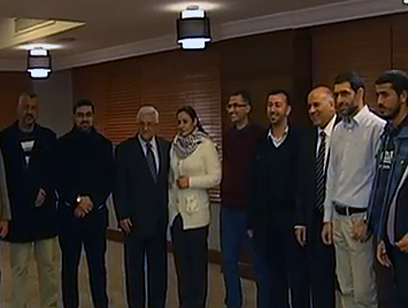 Abbas made the decision two years ago to award his organization's Al-Quds Medal to five Arabs who were all, at the time, incarcerated in Israeli prisons, having been tried and convicted for murder. One was a woman called Tamimi, convicted on 15 counts of murder, including the murder of our daughter. Another was Amna Muna, sometimes called Mona Najar; sometimes called Mona Jaud Awana; always called terrorist and convicted murderer. She earned those labels not through her political views but by reason of the cold-blooded murder of an unarmed Jewish boy of sixteen which she engineered and which took place in front of her eyes. (The background is here.) Why engineer a murder? Turns out that Mona had been present at the Ramallah lynching in October 2000 when two Israelis were ripped apart, literally, by a mob of frenzied Arabs. And she was "excited" by what she saw. It was reported back in April 2008 that Abbas was going to present those medals in a ceremony timed to coincide with the sixth anniversary of the deadliest suicide-bombing of this Arafat War, the massacre in Netanya's Park Hotel on the first night of Passover 2002. Thirty-three Israelis were murdered on that festival night. Thus April 17, 2008 was a propitious date on which to honour persons who embody the highest expression of current Palestinian Arab values. A day before the 2008 ceremony, Abbas "decided" to give in to pressure from the US government and canceled the award. But plainly that was not a reflection of how he felt. Damn, he was proud of that woman. And today (Wednesday) in Turkey, in the middle of a packed and politically important visit to the Recep Tayyip Erdoğan regime, the Palestinian president found time to show it ("Abbas Meets Woman Who Aided 2001 Murder Of Israeli"). And for good measure, the convicted mastermind of the Netanya massacre, Nasser Yateima, who had been serving 29 life terms when released from Israeli prison in October's terrorists-for-Gilad-Shalit deal, was in the deal too. What sparkling conversation this tight little group must have had! When, like us, you follow closely the media reports of convicted murderers who got free as a result of a massive act of extortion ("A monster walks the streets and she has many accomplices", you tend to pick up things that less-interested people might miss. For instance: we noticed that the two women mentioned here are almost always smiling broad teeth-baring smiles when they appear in the newspapers. This might be considered odd given that they are, and always will remain, convicted murderers even if they currently walk the streets free as birds. In this picture, above, Tamimi is snapped inside her Israeli prison cell a moment after the interviewer told her, evidently for the first time, how many children died as a result of the actions she carried out and for which she was sentenced to sixteen life terms. The picture appears in many places on the web, and it's often noted that her face bears a beatific smile. Hard for us to argue. This is one very happy woman. Dead Israeli children evidently have that effect on her. This is Mona aka Amna on March 18, 2001. 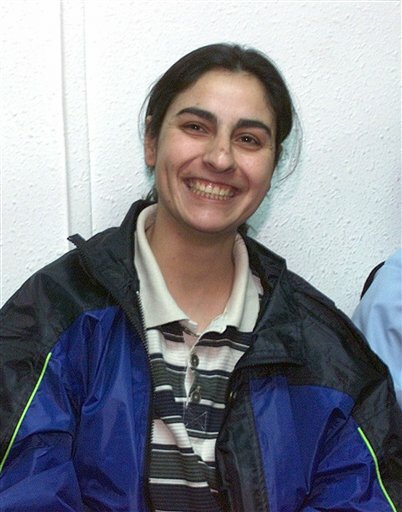 Another killer who displays genuine, straight-from-the-heart happiness as she smiles for the media at a court appearance during the trial ten years ago for which she was convicted of murder. You see her deep regret over the loss of an innocent young life, right? And here's Mahmoud Abbas in Cairo recently. He's smiling broadly. This is unusual for the man. 95% of the published news pictures in which he appears show him scowling. Here, he's happy. Why so? 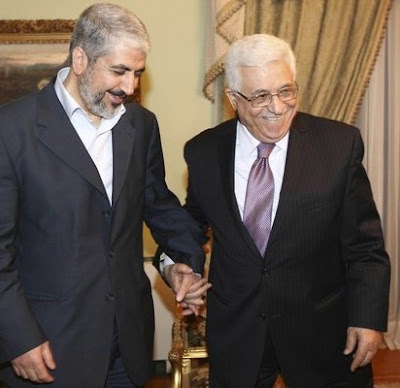 Perhaps because his fingers are intertwined with those of Khaled Meshaal. The latter may be the head of Hamas, his arch-foe and competitor in the business of executing and encouraging terrorism. But he's someone who understands the central importance of killing the children of your enemy when you're engaged in jihad to the death. Someone you can work with. Someone you can like. 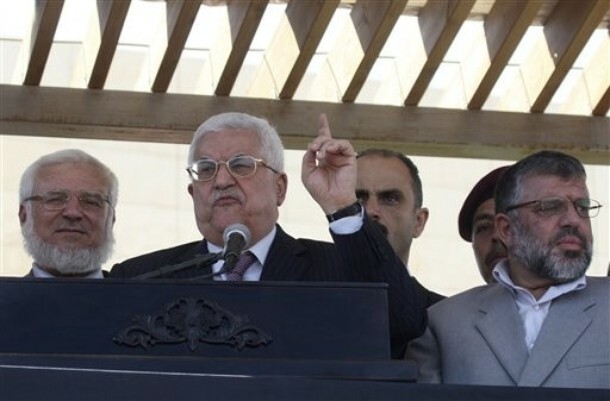 As to why Mahmoud Abbas is routinely called "moderate" and a seeker of peace, that's a tough one. Perhaps the question could be directed at the two women above. That smile is so deeply ugly.